Watch the Not In Our School campaign kickstart! Bikers from the Bay Area Coastside Armada Harley Club rev'd their engines to kickstart a Not In Our School anti-bullying campaign at Peralta Elementary School at 9 a.m today. The Coastside Armada teamed up with national nonprofit Not In Our School to launch Peralta’s anti-bullying program today. The Not In Our School campaign takes a proactive stance to bullying by nurturing a safe and accepting culture among the diverse student body, according to Peralta principal Rosette Costello. Watch the video and hear the enthusiasm! Our wonderful school has been recognized for its brilliance by the US Dept. of Education! We have been awarded a National Blue Ribbon School Award. Kudos to Rosette and the amazing teachers and staff. Also to the entire school community for doing such a wonderful job of creating and maintaing a successful, thriving school for our children. The Blue Ribbon Schools Program (BRSP) recognizes elementary and secondary schools that are both academically superior and have demonstrated dramatic gains in student achievement, while serving an economically disadvantaged population of students. Schools recognized through the BRSP are national models of excellence for other schools to emulate. All of the 2011 nominees were either previous California Distinguished Schools or California Title I Academic Achieving Award schools. Peralta was 1 of 21 California schools, and only 1 of 2 Alameda County schools recognized. Peralta students' art will be showcased at the Albany Film Fest this weekend! Three short films, all produced by students last year, will be shown in the first hour of the festival. Admission is $5 for adults and just $1 for kids (see location and map below). Kicking off the festival at noon will be "Things That Spin," an animation piece by Ms Larsen's and Ms Hackett's second graders last year. During that 1st hour there will also be a screening of "Trash Elimination," created by Ms Ana's 4/5th graders from last year, and "Land Beneath Our Feet," a history of the East Bay done in paper cutouts by 1st graders in Ms Lucker's class last year. 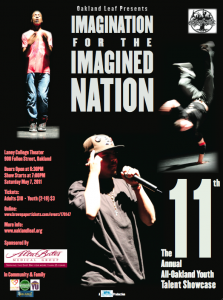 Check out Peralta Talent May 7 at "Imagination for the Imagined Nation"
A few weeks ago, Peralta hosted tryouts for the 11th Annual All Oakland Youth Talent Showcase. The results are in and four acts made it into the show! Three students will perform solo—singing, playing the flute, and performing tongue twisters—and Ana Thomas' class will show a remake of their fabulous Trash Elimination Video. It is on May 7th, 2011 at 7 p.m. in the Laney College Theater. Click on the poster to get more info. It sells out fast! 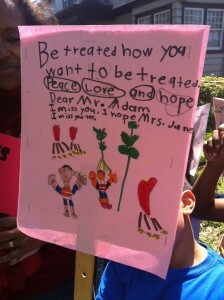 On Thursday afternoon, Peralta's 300 students demonstrated their love for Adam Williams and showed messages of peace and caring to the community as they marched up Alcatraz to College Avenue and back to school. They chanted "Adam, Adam, Adam!" 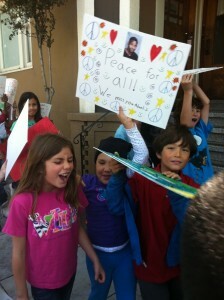 and "We want peace!," waving signs they had made during the day. They were joined by Adam's family and friends, including his mother, June Edwards and son, Amari. Mr. Adam—as the kids knew him—worked as an aide and mentor in the P.E.A.C.E. after-school program. He was killed last Sunday night, the victim of a botched street robbery near Jack London Square. Mr. Adam touched the lives of many Peralta children. He is greatly missed.